(Chart of the Pacific Ocean with California as an island) - VAN KEULEN, G.
Title : (Chart of the Pacific Ocean with California as an island). Map maker : VAN KEULEN, G.. Date : Amsterdam, 1738 - 1751. Size : 20.1 x 23.6 inches. / 51.0 x 60.0 cm. 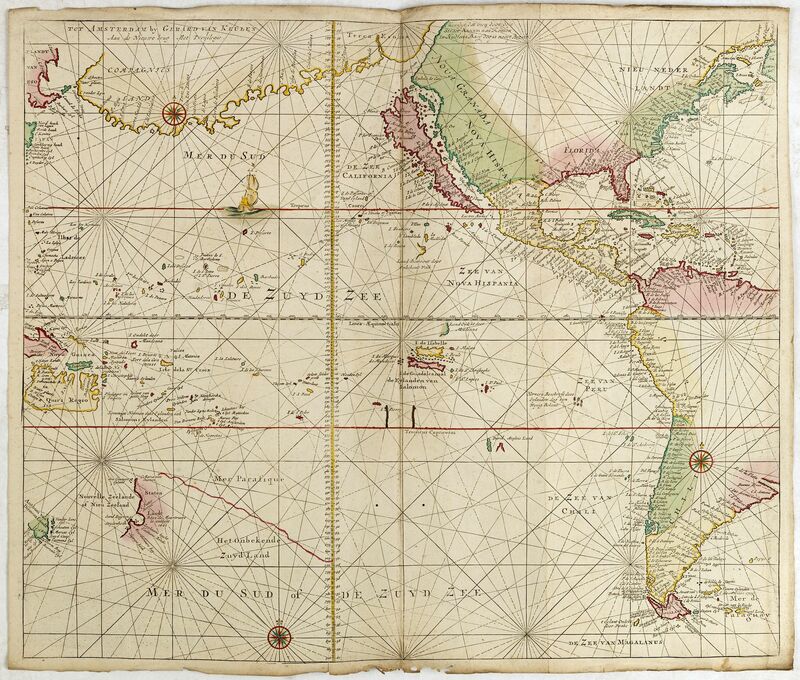 Description :A rare chart of the Pacific with California with indented northern coast and Strait Anian to the north. There are lots of place names along the coasts of North and South America. With compagnies Land to North West and now with a completed coastline. Van Keulen does show early detail for New Zealand and shows Tasmania. Condition : Printed on heavy paper. Two worm traces in center of chart. Paper slightly age toned. Somewhat frayed lower margin. In good condition.